Well that got us thinking, about if players such as Rooney, Ronaldo, Kaka never made it BIG in the football scene, what would they be doing right now. In the scenario explained in the above paragraph (which by the way is purely frictional) what if Rooney wasn't there? The outcome might have been different. So here's a list of possible occupations for our soccer studs. Wayne Rooney - The English striker now, in white hot form, loves to overpower defenders and drive the ball into the back of the net with such power that the ball almost cuts through the net. Well if he wasn't taking England to International glory, or playing for his beloved club Manchester United, he would surely be a stay at home dad with a pot belly, drinking beer and yelling at the television. Lets face it, Wayne Rooney can never earn a college degree, and in this economy he would surely be unemployed. So he would be living off his wife in a two bedroom apartment somewhere in London. He would be the real life version of Homer Simpson, except without a job, a killer sense of humour or yellow skin. Frank Ribery - If anyone can replace the legend that is Zidane in the French National Team and lead the team to World Cup glory, it is Frank Ribery. The French midfielder played a crucial role in Bayern's success this year, both domestically and in Europe. The man has a voracious appetite for scoring goals and he is one of the hardest working football players in his generation. Ribery is also one of the hottest players in football at the moment, with giants such as Manchester United, Real Madrid looking to steal the striker away from Germany. So what if he never played football professionally he would surely be a mugger or a robber or a hitman for some kind of Mafia or a gangster chief. Just looking at Frank Ribery makes the hair on the back of my neck stand up. He looks like a serial killer and he has serious upper body strength, enough to make a grown man cry for his mommy. He even has a scar on his face and he seldom smiles, and trust me you do not want to meet him in some dark alley in France. 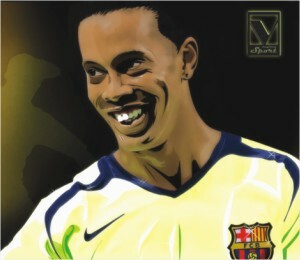 Ronaldinho - This man needs no introduction. Easily, one of the all time great and arguably the most entertaining footballer to ever play the game, the Brazilian is loved by almost everyone.... even people who hate Brazil. Even though he has not been selected for the World Cup this year, I just had to include him on my list... I mean its Ronaldinho for crying out loud. Anyways, if he weren't playing football professionally he would definitely have made it big as a football free-styler. Because I feel God created Ronaldinho to dazzle the crowd with his awesome footwork. He would be free styling in some favela in Brazil, where he would be caught on camera by some tourist. He would post the video on Youtube and the video would get a million hits in about two weeks, thus propelling the Brazilian to super stardom. John Terry - The former English captain in undoubtedly the best defender England has produced. The Chelsea captain has lead his team to the English double, winning both the premiere league and FA Cup this season. However the win came with a price. John Terry has faced a lot of criticism and has been under public scrutiny for a long time following his scandalous affair with Wayne Bridge's ex wife. So any guesses on what JT would be doing if he wasn't playing football? He would be working on some Fish and Chips store by day and at night he would be one of those men of negotiable affection. Confused? Well the more mature readers get it. David Beckham - Well he is not playing football anymore, is he...So he would be doing whatever he is doing right now...Absolutely nothing. WHAT is the first thing that comes to mind if you see a 4-coloured poster of ecstatic looking Shrek Wayne Rooneys and Kakas in their respective national team uniforms with an alluring headline: “World Cup Dhamaka- Bishaaaaal Discount”? The data processing unit of the human brain should direct the train of thoughts to this- “Whoa! Are they selling jerseys cheaper?” But when yours truly got close enough to the advertisement to read the contents he was brought back from the Fairy Tale land where he was boasting a collection of medium sized Messy jerseys to the harsh reality that is present only in Bangladesh. The poster was actually about how a shop was selling its Gabardine Pants, (100%) Cotton Trousers, shirts and pairs of socks at a great discount of 10%. What the heck? * Flags: Surprisingly the rates for flags haven't decreased at all, even though we vent our hearts through them. In fact, these should be free of charge. If we could just show the picture of Dhaka city with the enormous number of Brazilian and Argentine flags to the respective presidents, we can hope that they could do something about it. * Alarm clock: This will be a late night World Cup for us. In order to wake up in time for the matches at 4 am in the morning, we will need some flashy alarm clocks and hence a good discount on them. * Discount on Personal TV sets: There will be many cases of the poor and helpless TV sets being banged up after a heated after-match family analysis. Those small, rectangular, black and white TVs at every room will be a great addition to the world cup merchandises. * Mattresses: In case the PTVs are not available, we will need mattresses if we want to hang out in front of the TV sets late into the night. It' not like we can stretch all we want on the couch, is it? We love to stretch and relax, we do. * Brand spanking new, smoking hot high definition PC: Err... we really need a new PC every once in a while. The new F*FA game won't run on the old, battered, uncool computer of ours. 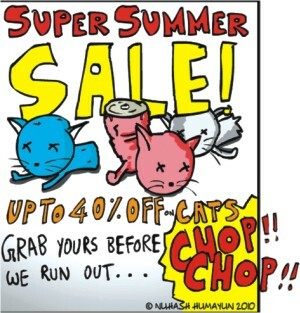 We demand a great discount on them. Let's form a human chain (everyone does it). The last one, I don't want a discount just because I need it myself. No, not at all. So, stop tihnking like that. FOOTBALl isn't just a game. It's so much more. So to celebrate football and all that comes along with it, the Goethe Institut brings you 'Football Fever'. Running from the 11th to the 30th of this month, it includes public screenings of all German and Swiss matches. Live commentary will be provided by prominent personalities including international ambassadors and ex-national football stars. The semi-finals and final match of the World Cup will also be shown on the big screen. Swiss and German matches that take place late at night will be re-screened in the afternoons for the fans' convenience. Add to that a quiz competition, music, German food, and a chance to get your face painted in team colours! The Goethe Institut certainly knows how to throw a football fiesta. There will be screenings of football-themed German movies with English subtitles. A football tournament is planned for the PASCH (partner schools) of the Institut, and will be held at the National Stadium on 19th June. Later in the day, a friendly match will take place at the same venue between German speakers living in Bangladesh and ex national football players. The month long 'Football Fever' will be inaugurated on 14th June, with the screening of Germany's first game in the World Cup versus Australia. 'Football Fever' is organised by the Goethe Institut in cooperation with the PASCH, the German and Swiss embassies, and the Bangladesh Football Federation. And join the Facebook group 'German Football Society'. And had no hearth or fire! To fall into it and cry! To get out and give a try! But surely it was a dream of fees!